As AI-powered smart assistants are taking the forefront, be it on our smartphones, PCs or smart speakers, Microsoft is aggressively pushing Cortana to take a spot in the ecosystem. The software giant has already released a Cortana-powered smart speaker but it has now found a partner in Ireland-based Johnson Controls to launch a smart thermostat. That too, just in time for CES 2018. 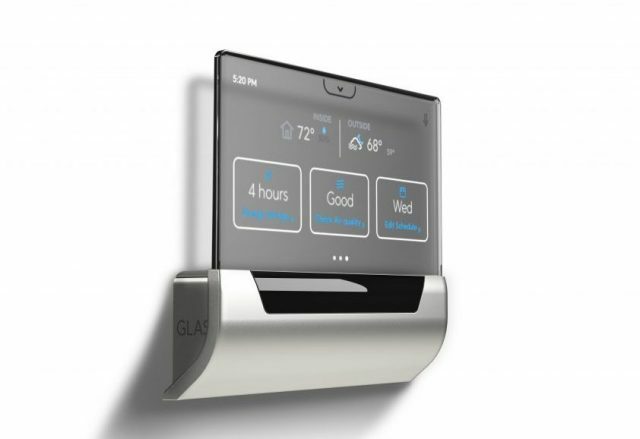 Dubbed as GLAS, Microsoft first showed off its Cortana-powered thermostat way back in July last year. The specifics of the device was a little scant back then but the company is today telling us everything, even the $319 price tag. This elegant thermostat, if you didn’t already notice, comes with a translucent glass OLED touchscreen and that’s what makes it stand out from the competitors, especially Nest. The screen, which rests on a metallic processing unit, displays everything from the room temperature and weather forecast to traffic info and your upcoming tasks. This thermostat continuously tracks indoor and outdoor air quality and adjusts the temperatures instinctively to maintain a pleasant working environment. You have full access to temperature settings but a need to intervene may never arise, says Microsoft. It can even “intelligently” detect when you’re home or not, to adjust the temperature accordingly. The thermostat is powered by Qualcomm’s Snapdragon 410E embedded processor and can be installed in both residential and commercial buildings. GLAS is said to support most 24VAC heating and cooling systems, no matter what the heating agent. You can also control the thermostat with its companion mobile app, available both on Android and iOS. All this has been made possible, thanks to the Windows 10 IoT Core operating system which powers GLAS thermostat. This is the underlying platform that makes this device tick but it isn’t the only thing making the GLAS stand apart from its competitors (discussed below). Johnson Controls, the 130-year old Ireland-based company that invented the first room thermostat, has partnered with Microsoft to redefine the device whose only job is to merely regulate the temperature. The GLAS comes back with Microsoft’s AI assistant Cortana, which turns this thermostat into a smart speaker as well. You know what this means, right? You can simply call out and say “Hey Cortana, set the temperature to 68 degrees,” to adjust the temperature of your living space. With the integration of Cortana into the GLAS thermostat makes it multi-functional, thus, eliminating the need for a smart speaker. It can inform you about upcoming meetings, traffic updates, weather info, answer questions, and more. But, you may be thinking, Cortana is not as resourceful as its smart assistant competitors, such as Google Assistant or Alexa. I know this very well. Microsoft is, however, working its way through the clutter with a one-of-its-kind product and Cortana is learning handy new tricks with each passing day. The smart thermostat ecosystem, which has been popularized by Google Nest, has now stepped up to be more than just a niche. According to recent reports, the market for smart thermostats is expected to swell up to $5.9 billion by 2020, that too with a CAGR of 32 percent between 2105 and 2020. Thus, Microsoft dipping its toes in the said ecosystem, in conjunction with an age-old thermostat company, is no fool’s play. While Nest may have already made its mark in the thermostat market, Microsoft is looking to reserve a spot for its gorgeous-looking thermostat in the home or office. This also gives them a chance to further propel Cortana to users, beyond just Windows 10 PC and laptops. And while we’re on the topic of smart home appliances, it is not just aforementioned tech giants who’re joining the race to dominance. Even Amazon is determined to soup up their presence in our home with the acquisition of the smart camera and doorbell startup, Blink. And if their strategy works out as well as the Alexa-powered Echo devices then the competition might have a big problem on their hands, especially given its breadth in distribution and retail. Putting all that aside, I really love what Microsoft has done with GLAS because it looks so elegant. Even though it is powered by Cortana, I will be right at the front of the line to give it a go, if given the chance. What about you? Does this thermostat look attractive and useful to you as well? Share your opinion in the comments down below.